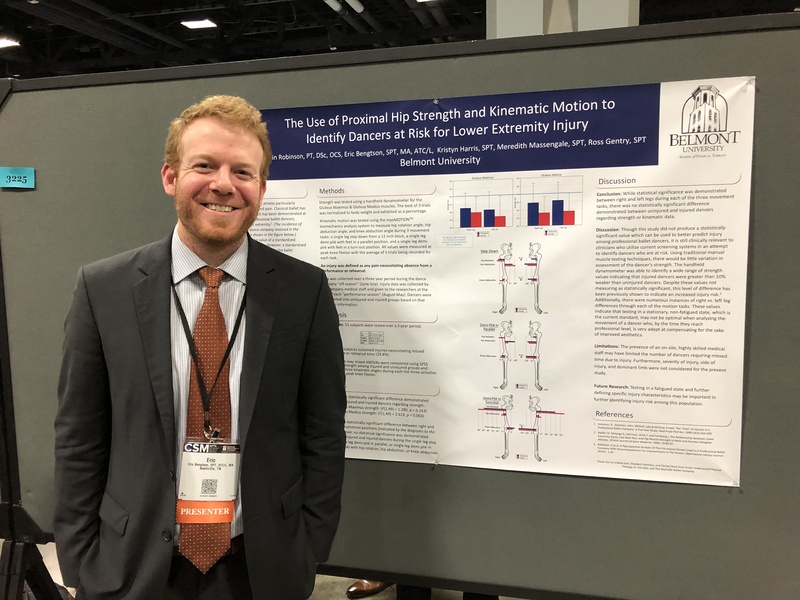 Belmont Physical Therapy students recently presented research at the national physical therapy conference, Combined Sections Meeting (CSM), in Washington DC in January. Eric Bengston presented on behalf of his group which included classmates Kristyn Harris, Meredith Massengale and Ross Gentry and faculty advisor Dr. Kevin Robinson. This research project is the third phase of a project investigating the strength and functional testing of Nashville ballet performers with a goal of identifying dancers at risk of developing an injury. Student Tyler Hoek presented his group’s research poster, developed by students Tiffany Bennett, Sheyenne Turk and Zach Petrosky with faculty advisors, Kevin Robinson, Craig Parker, Pat Sells and John Halle. This project was investigated the effect of an 8-week neuromuscular training program on lower extremity biomechanics of collegiate athletes, and is geared toward helping to reduce the incidence of non-contact injuries such as ACL injuries in athletes.